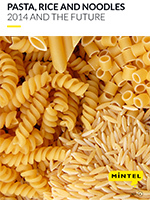 This global annual market overview will provide you with an in-depth review of the key issues in the global pasta, rice and noodles market through 2014 as well as our forecast for what will happen in 2015 and beyond. With increasing retail sales occurring in those developing markets in which rice is a staple, and buoyant sales in many developed markets, the outlook for the category is bright. In developed markets, rice has found favour amongst those avoiding gluten and those exploring the world of ‘ethnic’ cuisine. Rising health consciousness has seen increased consumption of brown rice in many markets. The pasta category experienced a lacklustre performance over 2013 with many markets exhibiting flat or negative growth. Russia remains the only market in the top 5 that is experiencing healthy growth and this represents an opportunity for brands able to establish themselves. In many ways, pasta has become a victim of rising interest in gluten-free, high protein and paleo diets. This is a key issue for brands in the category to resolve to ensure on-going prosperity of the category. Innovation and new markets have driven growth in the instant noodle category. Market leading brands have continued to expand into new markets in Africa, the Middle East and Latin America providing new revenue streams for these organisations. To learn more about this report please contact us.